Premium Black Double Wall Stove Pipe available in 6 and 8 inch sizes. 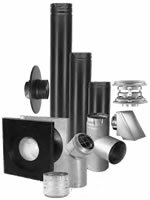 Double Wall Stove Pipe is ideal for close installations where there is less than 18" clearance from combustible materials. This type of stove pipe provides the maximum protection for your walls and ceilings. Double wall pipe will also last many times longer than traditional single wall stove pipe.